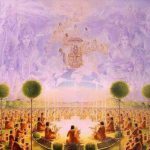 The question of sampradaya, or the disciplic lineage of spiritual teachers, is the basis of authority for all religious and philosophical teachers and movements arising from the Vedantic traditions. There is no conception of religious organisation among these traditions which does not include reference to sampradaya. Therefore, questions of succession and how the links are made to traditional successions is the most essential ingredient in understanding authenticity and integrity in precept and practice among most of the Indian sub-continent’s spiritual movements. 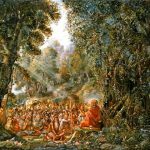 Thus, this interview between Steven Rosen and William Deadwyler is a very important contribution to our understanding of the Hare Krishna movement and its roots. 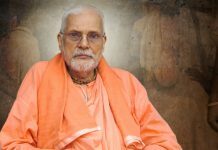 The research and information shared in this interview also presents one of the most comprehensive accounts of the Brahma-Madhava-Gaudiya sampradaya available to us today. Steven Rosen: Most people who study East Indian philosophy don’t know about the parampara system. They’ve heard about guru / disciple relationships, of course, but they generally don’t know about the authentic preceptorial lineages ― the various Vaisnava sampradayas― and the importance of being initiated into one of those traditions. So I thought that we could perhaps begin by explaining, philosophically and scripturally, the importance of the Vaisnava sampradaya. Dr. Deadwyler: The notion of sampradaya ― also called parampara,which means, literally, ‘one after another’ ― is found in the fourth chapter of Bhagavad-gita. There Krsna says that he originally taught the Bhagavad-gita to the Sun god Vivasvan, who taught it in turn to Manu. Then Krsna says, evam parampara praptam imam rajarsayo viduh: this secret teaching was passed down in this way, one after another, in parampara, and the saintly kings all understood it in that manner. Here we find the notion that sure and certain knowledge is revealed. It is transmitted through spiritual sound ― sabda ― which is only truly given by Krsna or his representatives in disciplic succession. Philosophically you can call this ‘a descending process’ (avaroha pantha)― the knowledge comes down from Krsna, who is God and therefore perfect. The purpose of a tradition, or a genuine guru, is to preserve the original and perfect revelation intact and complete. You can’t improve on it. You can’t add to it, but rather you preserve it and teach it. Steven Rosen: Now, there are a lot of gurus in India, and perhaps elsewhere in the world as well. But which gurus represent the genuineparampara system? Or, more important than that ― which lineages are authentic from the Vaisnava point of view? I mean, if one were looking for a guru, which lines of disciplic descent should one be aware of? Dr. Deadwyler: You’re asking about the recognised sampradayas.Well, the word sampradaya literally means ‘a community’. A text from the Padma Purana quoted widely in Vaisnava writings speaks directly about these authorised communities. It says that ‘Those mantras which are not received within a sampradaya are fruitless; they have no potency’. The text then specifically names the sampradayas. ‘In the Kali-yuga, there will be four sampradayas.‘ ― we are talking about Vaisnava sampradayas­ ― ‘They are the Brahma Sampradaya, originating with Brahma; Sri Sampradaya, starting with Laksmi; Rudra Sampradaya, starting with Siva; there’s another one starting from Sanaka and the others, the Kumaras’. Those are the four recognised Vaisnava sampradayas. Steven Rosen: In regard to the Visnusvami Sampradaya, I’ve heard something to the effect that Vallabha and Visnusvami were the same person. True or not? Dr. Deadwyler: No, Visnusvami was much earlier than Vallabha, and I believe that none of his works have survived. Now, Vallabha, who was a contemporary of Caitanya Mahaprabhu, said that he was associated with the sampradaya of Visnusvami. But they are not the same person. In fact, Vallabha wrote his own commentary on Brahma-Sutra (the Anu-bhasya) and on Srimad Bhagavatam (the Subodhini) and founded his own group called the Pusti-marga, although he is closely linked with the Rudra Sampradaya. However, he doesn’t seem to have received much specific traditional teaching from the Rudra Sampradaya. So Visnusvami is the one that we often hear of as being the principleacarya of the Rudra line, and he’s from way back when. No one knows his dates. But Vallabha was a contemporary of Sri Caitanya. The Vallabha line really has their own sampradaya; otherwise the Rudra line is not active, as far as anyone can see. Dr. Deadwyler: In a sense, yes, although most people just call it the Vallabha Sampradaya. I’ve never heard anyone refer to it as relating to the prior sampradaya or going back beyond Vallabhacarya. But formally they claim to be in the Rudra Sampradaya of Visnusvami. 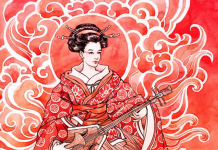 Steven Rosen: Have you heard that this verse from the Padma Purana  the one you quoted  has been brought into question by Stuart Elkman and even by O. B. L. Kapoor? They say that they can’t actually find it. Dr. Deadwyler: Yes, present-day scholars have claimed that current editions of the Padma Purana don’t include that verse. That may be so. But it’s quoted by Madhvacarya and other early writers. Dr. Deadwyler: Right. So it may not be in modern editions, but it was found there somewhere along the way. That’s the simplest explanation. Others will decide that the verse was fabricated or something of that sort … this is the virtue of accepting knowledge in disciplic succession. Believers will accept the verdict of their teachers, as it comes down through the tradition, the parampara system. Others will be confused about this. Unfortunately, there are different versions or manuscript traditions of various puranas ― it’s very difficult. There are many editions from various times and places. The Padma Purana is huge, too. I don’t know how many scholars have personally gone through it verse by verse. And the verse we’re talking about may be tucked away in some edition somewhere for all I know  for all anyone knows. 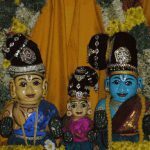 Steven Rosen: Well, whatever the case may be, we do indeed find to this day that those four sampradayas are in fact the major traditional lineages of Vaisnavism in India. So let’s move on from the four authorised chains of knowledge to how the Gaudiya Sampradaya is aligned with them. It is said that the Gaudiya school is connected to the Brahma-Madhva Sampradaya. Dr. Deadwyler: Yes. The claim for that is found in a number of places. The main reference is a list of the guru parampara found in Baladeva Vidyabhusana’s Govinda-bhasya and Prameya-ratnavali. And also in Kavi Karnapura’s Gaura-ganoddesa-dipika, the earliest statement. It’s also in another one, a younger contemporary of Caitanya  Gopala-guru. His work doesn’t survive, but it’s quoted somewhere else. Dr. Deadwyler: That’s right. There are eight places in addition to Baladeva and Kavi Karnapura where the affiliation is brought out. But the really significant ones are those that I’ve mentioned. Gopala-guru was a disciple of Vakresvara Pandita. Dr. Deadwyler: That’s it. And it’s also mentioned in the Bhakti-ratnakara of Narahari Cakravarti. Steven Rosen: Well, the other important place is Visvanatha Cakravarti’s Gauranga-svarupa-tattva-candrika. That’s a bit later, but it’s an important reference because he was such a prominent acarya. Dr. Deadwyler: Now he was an associate of Baladeva Vidyabhusana. Visvanatha Cakravarti was the very one who sent Baladeva to debate the authenticity of the Gaudiya Sampradaya. We can conclude that there was some agreement at that time that this list, with its Madhva connection, was indeed the correct parampara. At least these two important acaryas  Baladeva and Visvanatha  agreed. So, yes, Visvanatha Cakravarti also accepted it. This comes from the Vrindavana side  they all accepted the Gaudiya affiliation. So there was some consensus of opinion. But the earliest writer to attest to the affiliation was Kavi Karnapura. In other words, the idea was there in Orissa as well. Of course, Baladeva was originally form Orissa himself. There’s a work by a Mukherjee called The History of the Caitanya Faith in Orissa. Steven Rosen: Oh, Prabhat Mukherjee. He’s a very important and well-known historian of Oriyan Vaisnavism. 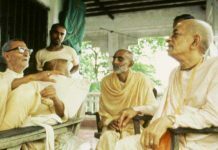 Dr. Deadwyler: Prabhat Mukherjee finds a number of Oriyan Vaisnavas who affiliate themselves with Caitanya and give a guru parampara that includes Madhva. So it seems to have been accepted in Orissa at a time soon after Caitanya’s disappearance. Thus, there was a firm, early tradition that Caitanya’s disciplic succession descended from Madhvacarya. And so it’s called the Brahma-Madhva-Gaudiya Sampradaya. Some scholars, however, have held that the affiliation was an invention of Baladeva Vidyabhusana, who was originally a Tattvavadi, a Madhvite. Then, through his spiritual master, Radha-Damodara, he became a Gaudiya Vaisnava. So some people think he had ideological motives for ‘affiliating’ the Caitanya movement with Madhva. S. K. De, one of the big doubters of the authenticity of the list, even hints that Baladeva himself may have written the Gaura-ganoddesa-dipika and attributed it to Kavi Karnapura, in order to back-date the affiliation. Dr. Deadwyler: There is no evidence whatsoever. S K. De’s ‘seminal’ book, Early History of the Vaishnava Faith and Movement in Bengal, which is probably the most comprehensive early history of Gaudiya Vaisnavism in Bengal, at least in the English language, is full of forced conclusions. Yet it remains the standard work on the subject, at least for scholars. De seems to bend over backwards to ape the manners of Western critical scholarship, and he tries to doubt everything conceivably doubtable. There’s almost a presumption of falsification in the documents  guilty until proven innocent. He questions the historicity of everything. So he cast doubt on this guru-parampara  the linking of the Gaudiya school with the Brahma-Madhva Sampradaya. Now he’s not alone in this, nor did the idea originate with him. He was following some earlier Bengali writers from the twenties and thirties. But you will find the first and one of the more prominent places where the affiliation is rejected is Surendranatha Dasgupta ― History of Indian Philosophy. In the fourth volume of that work, in the section on Madhva, Dasgupta lists the succession of Madhva gurus, stating that this is largely at variance with the list given in the introduction of the commentary on the Brahma-Sutra by Baladeva Vidyabhusana. After quoting Baladeva’s list, Dasgupta tells us (on Page 56 of Volume 4): ‘We see that the list given by Baladeva is in total discrepancy with the two lists given from the Madhva mathas in Belgaum and Poona’. So Dasgupta rejects it. However, one of these offshoot mathas, called the Vyasa-raja Matha, records a line of disciplic succession that appears quite similar to the one Baladeva and Kavi Karnapura give. And this is an official Madhva list. I can go over it with you. Here’s what happened. After Madhva, we find listed Padmanabha, Nrhari, Madhava, and Aksobhya. Now in the Madhva tradition, these four are frequently regarded as direct disciples of Madhvacarya, although some places say that Nrhari, Madhava and Aksobhya were all initiated by Padmanabha. At any rate, they’re pretty much contemporaries. Aksobhya’s disciple was Jayatirtha. He was the famous commentator and systematiser of Madhva’s teaching. All of these devotees, by the way, were the heads of mathas, mahantas or ‘pontiffs’ as Sharma calls them. There may have been other advanced acaryasduring their time. But the list only contains the leaders of the matha. After Jayatirtha, the official Madhva list mentions Vidyadhiraja. The list from Baladeva, however, has Jnanasindhu, Dayanidhi and then Vidyanidhi. The list from Kavi Karnapura has Jnanasindhu and, instead of Dayanidhi, Mahanidhi, and then it also has Vidyanidhi. So if you accept, as Sharma does, that Vidyanidhi and Vidyadhiraja are the same person ― just a variation of the same name ― then what you have in Baladeva’s and Kavi Karnapura’s list are two names, Jnanasindhu and Dayanidhi or Mahanidhi, that are introduced between Jayatirtha and Vidyanidhi. After Vidyadhiraja or Vidyanidhi, assuming that it’s the same person, the branching off from the mathatakes place, and you get the distinctive Vyasa-raja Matha, named after Vyasatirtha, who was a later head of that matha and became very famous. Next in succession is Rajendra, who is in Baladeva’s list; then the Madhva list has Jayadhvaja whereas the Gaudiya lists give a variation on that name ― Jayadharma. And then it’s the same: Purusottama, Brahmanyatirtha, Vyasatirtha. So up to that point, everything’s fairly consistent. Dr. Deadwyler: Exactly. Well, first of all, there’s the controversy that concerns Surendranatha Dasgupta, which we’ve looked at ― he didn’t even recognise this list. But as we’ve shown, following B. N. K. Sharma up until Laksmipati Tirtha, there’s not a whole lot of difference in the two lists. 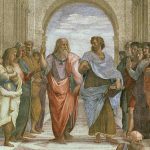 Steven Rosen: And minor differences shouldn’t be all that shocking, because, for example, if two disciples of different gurus are writing books, let’s say, five hundred years from now, and they make a list of teachers, each list would be different, leading up to their particular guru.That’s natural. It’s like a tree with many branches. Dr. Deadwyler: That’s right. But at this point we should deal with the second problem, the one that arises after Vyasatirtha. Dr. Deadwyler: Right. Although Laksmipati Tirtha is indeed absent from the Madhva list, there is a simple solution: this Laksmipati Tirtha wasn’t a mahanta. He was an initiated disciple of Vyasatirtha, but he was not at any time the head of a Madhva matha. I think that’s a very simple and likely explanation. Steven Rosen: You’re saying that his name isn’t on the list because he was not a leader. Dr. Deadwyler: Because the Madhva lists don’t contain every disciple. They list only devotees who served for some time as the heads ofmathas. Steven Rosen: I’m interested in something related to this: how would you explain that Laksmipati appears to be the last of the people with the ‘Tirtha’ titles? After him you have Madhavendra Puri. Dr. Deadwyler: That’s the more interesting puzzle. All of those acaryasup to that point have a ‘Tirtha’ in their names. Even Madhva’s name was Ananda-tirtha. The ‘Tirtha’ title originally came from a Sankarite order, because Madhva was initially initiated in the Sankarite order, and it is characteristic of Madhva sannyasis. So then you have Madhavendra Puri, Isvara Puri ― you get a ‘Puri’ title, which belongs to another Sankarite order. Now how does that happen? There are some plausible explanations for it. One of them is that Madhavendra Puri, in fact, took sannyasainitiation in an Advaitasampradaya ― just as Caitanya Mahaprabhu and, as a matter of fact, Madhva did. And sometimes when people took sannyasa, especially in those days, it didn’t seem to matter so much. They took from whomever was handy. That seems to be a reasonable explanation. The change in title doesn’t seem a sufficient reason to reject the lineage. The testimony that there was a Madhva connection is much older than Baladeva. And at least if you accept Kavi Karnapura and the similar traditions from Orissa, you can’t say they had some ‘ideological motive’. Another plausible scenario is that Madhavendra Puri could have already been a Mayavadi sannyasi and then met Laksmipati Tirtha. Vyasatirtha is said to have died in 1539, so he was also a contemporary of Caitanya. 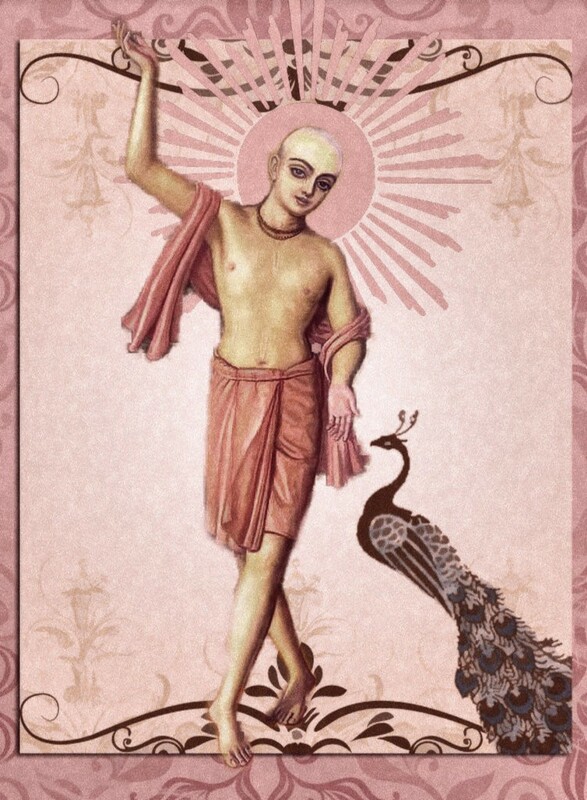 Caitanya’s lifetime was fairly short, but he was born before Vyasatirtha’s demise. Still it was possible for Vyasatirtha to have initiated Laksmipati, and that succession could have gone on during his lifetime. According to the Bhakti-ratnakara of Narahari Cakravarti, Nityananda was actually initiated directly by Laksmipati. Baladeva, on the other hand, lists him along with Isvara Puri and Advaita Acarya as disciples of Madhavendra Puri. 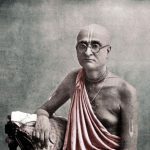 This can be reconciled with Narahari’s account, however, as Narahari says that although Nityananda was Madhavendra Puri’s godbrother, Nityananda always regarded him as his guru. Incidentally, Kavi Karnapura states that one of Jayadharma’s (or Jayadhvaja’s) disciples was the famous Visnu Puri, author of Bhakti-ratnavali. In that case, we have the Puri title appearing earlier in the list, as belonging to an acarya who was not a mahanta. B. N. K. Sharma speculates that this Visnu Puri may have been the actual teacher of Laksmipati, and so on, and thus the real link between Madhva and Caitanya. In this way Sharma and others, like Stuart Elkman, accept an historical Madhva connection, while having doubts about the exact list of Baladeva or Kavi Karnapura. Steven Rosen: Right. I have a few quotes about Madhavendra Puri here: Vrndavana dasa Thakura, in the Caitanya-bhagavata, refers to him as ‘the prime architect of the devotionalism in Bengal’. Krsnadasa Kaviraja calls him ‘the first sprout of the wishing tree of devotion’. So it seems that Madhavendra Puri moved the Brahma-Madhva conception from awe and reverence, or worship of Narayana (which was more common in the Madhva Sampradaya), to worship in madhurya, or the sweet loving aspect that’s found in Radha-Krsna. Apparently, there’s some element here of moving from vaidhi-bhakti to raganuga-bhakti. Dr. Deadwyler: Precisely. That’s what the commentary is talking about here. Madhavendra Puri, the commentator notes, was ‘the first to write a poem beginning with the words, ayi dina-dayardra natha he‘. This verse is recorded in Caitanya-caritamrta, Antya-lila, chapter eight, verse thirty-four. I’ll return to the poem later. ‘In that poetry,’ the commentary continues, ‘is the seed of Caitanya Mahaprabhu’s cultivation of love of Godhead.’ So that seed is contained in Madhavendra Puri’s verse, and that verse expresses Radharani’s anguished feelings of separation from Krsna. The Caitanya-caritamrta says that Madhavendra Puri was reciting this very verse while passing away from the material world. I’ll give you the translation: ‘O Lord, O most merciful Master, O Master of Mathura! When shall I see You again? Because of my not seeing You, my agitated heart has become unsteady. O most beloved one, what shall I do now?’ This is Radharani speaking, expressing her most intense love in feelings of separation. The Caitanya-caritamrta (Antya-lila 8.35-6) says, ‘In this verse Madhavendra Puri instructs how to achieve ecstatic love for Krsna (krsna-prema). By feeling separation from Krsna, one becomes spiritually situated. Madhavendra Puri sowed the seed of ecstatic love (prema) for Krsna within this material world, and then departed. That seed later became a great tree in the form of Caitanya Mahaprabhu. Dr. Deadwyler: Yes. Ayi dina-dayardra natha he. 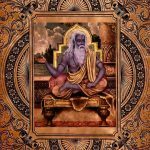 The Caitanya-caritamrta continues: ‘As the kaustubha-mani is considered the most precious of valuable stones, this verse is similarly considered the best of mellow poems. (rasa-kavya, poetry about rasa). Actually this verse was spoken by Srimati Radharani Herself, and by Her mercy only was it manifest in the words of Madhavendra Puri. So what is this saying? It’s saying that Radharani revealed this verse directly to Madhavendra Puri, or that by Her mercy it was manifest in the words that emanated form Madhavendra Puri’s mouth. And then Krsnadasa Kaviraja says, ‘Only Caitanya Mahaprabhu has tasted the potency of this verse. No fourth person is capable of understanding it.’ That is, only Srimati Radharani, Madhavendra Puri and Caitanya Mahaprabhu understood this verse. Then it says, ‘Madhavendra Puri recited this verse again and again at the end of his material existence. Thus uttering this verse, he attained the ultimate goal of his life.’ And then the verse is quoted in Text 197. Here, we see Prabhupada’s statement that it was a sannyasa initiation. If this is so, the ‘Puri’ title must have been used in the Madhva order, at least outside of the formal matha structure. Kavi Karnapura’s mention of Visnu Puri as a disciple of Jayadharma (Jayadhvaja), gives some support for this idea. Anyway, the commentary goes on: ‘Beginning from Madhvacarya down to the spiritual master of Madhavendra Puri, Laksmipati Tirtha, there was no realisation of devotional service in conjugal love.’ Then he says, ‘Sri Madhavendra Puri introduced the conception of conjugal love for the first time in the Madhvacarya Sampradaya.’ So here on the Gaudiya Vaisnava side is a frank recognition that there was something new with Madhavendra Puri in this sampradaya. Dr. Deadwyler: That’s where they’ll go; they’ll go to Vaikuntha. And if in the Sri Sampradaya they were worshipping Sita-Rama, for example, then that’s what they’ll attain ― Ayodhya ― which is also Vaikuntha. What the Gaudiya Vaisnavas generally say is that Caitanya’s philosophy of acintya- bhedabheda-tattva, and also his teaching on themadhurya rasa, are a kind of synthesis and capstone of the philosophies of the four sampradayas. Yet it’s significant that Caitanya himself took initiation in the Madhva Sampradaya. He singled it out, so to speak, because of his appreciation for its strong polemic against the Mayavadis. More than anyone else, Madhva and Jayatirtha really were ferocious in their opposition to the Mayavadis. Now you can list a number of differences between what’s commonly accepted as the philosophy of Madhvacarya and that of the Six Gosvamis. But you can make another list of similarities. If you ask me, the similarities are greater. So it’s really a question of what you consider important, and what you consider secondary. With a teacher as rich and profound as Madhvacarya, it’s a question of what in his writings becomes emphasised, what becomes expounded upon by his followers, what becomes the prevalent mode of teaching. And there will be other things latent in those teachings which will not receive much emphasis, and yet may seem to be of greater importance at a later time. So it’s a question of how you look at it. There are differences. And finally, that’s why Baladeva Vidyabhusana, who’s one of the big proponents of the Madhva affiliation, also had to write a separate commentary on Vedanta-sutra specifically for the Gaudiya Sampradaya. Because there are certain things in Madhva’s works ― relating to Gaudiya practices ― that you won’t find, such as the worship of Radha-Krsna together. This won’t be found in Madhva’s works. The Madhvites worship Narayana, and they generally don’t worship Laksmi-Narayana as well ― just Narayana alone. The fact that there are differences between the philosophy of the Madhvites and the Gaudiyas is not argument against historical affiliation. Steven Rosen: You know, in some ways, it always seemed to me that the Sri Vaisnavas ― the Ramanujites ― were very close to the Gaudiya idea. At least as much as the Madhva teaching. You know, when Mahaprabhu met with Vyenkata Bhatta , they seemed to really get on pretty well. And the saktithing is there ― Laksmi-Narayana. So there is a closeness. Dr. Deadwyler: Right. Well, it depends on what Madhvite you talk to, you know. I’ve spoken to some who strongly remind me of a kind of Christian, actually, in their ‘this is the only way’ mode of relating. Their emphasis on duality, a dualism that they have emphasised, also sometimes seems quite extreme ― ‘there’s no oneness between God and the living being, no similarity whatsoever.’ Well, I don’t know if I can accept that. On the other hand, a scholar like B. N. K. Sharma, who’s a Madhvite scholar, will say that Caitanya’s acintya-bhedabheda-tattva is really just a variation of Madhva’s category of visesa. And he sees a clear development out of Madhva’s teaching. Whereas some other scholar will say, ‘You know, they’re two completely different things’, and so on. Steven Rosen: I once read in an early Harmonist that the reason Mahaprabhu chose the Madhva Sampradaya with which to align himself, as opposed to the other sampradayas, was because Madhvites emphasised duality ― they taught that the living being is different to God. And when there’s a difference, there’s more of an aptitude for service. Dr. Deadwyler: This reminds me of something I wanted to speak about. What gives some scholars problems ― on the doctrinal level ― with this Madhva affiliation is the high respect Caitanya Mahaprabhu gives Sridhara Svami’s Bhagavata commentary. Most scholars regard Sridhara Svami as an Advaitin, and he was regarded in this way by Sankarites, too; they accepted him as one of them, although he did get into trouble with that community. His commentary on the Bhagavatawas controversial, and it did seem as though it might not have actually been accepted because Sridhara Svami did recognise a quantitative difference between the soul and the Supreme Lord. And, of course, there is a Madhva idea here, as you mentioned. So the Gaudiya Vaisnavas do not accept him as a real Advaitin. Even though he was apparently recognised by the Sankara Sampradaya as one of them, they thought he was trying to stay too close to Vaisnava ideas. As far as the Vaisnava sampradayas are concerned, we have to recognise a great deal of overlapping. The four orthodox sampradayasteach basically the same thing, which is that is one is an eternal servant of Visnu or Krsna, or one of his many incarnations. The emphasis and the details may differ, but the truth is ultimately one.